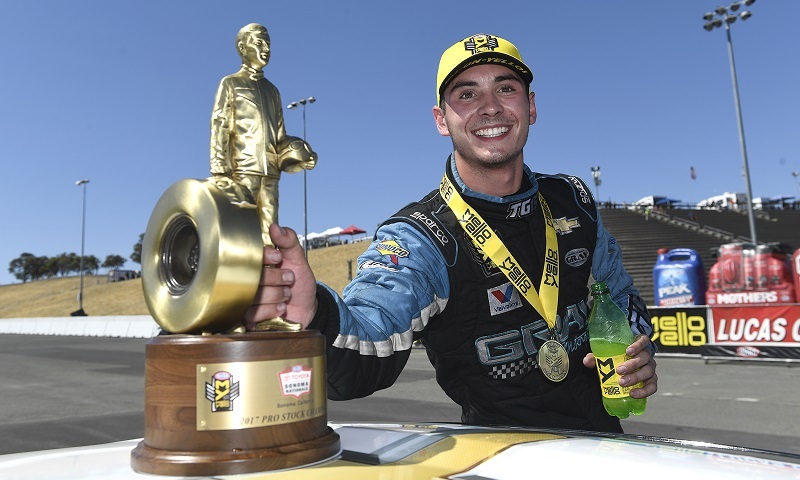 MOORESVILLE, N.C. — Photo Courtesy Marc Gewertz/NHRA –DGR-Crosley announced today that they have added NHRA Drag Racing standout Tanner Gray to their driver roster for 2019. Gray will compete full-time in the NASCAR K&N Pro Series East, as well as run select K&N Pro Series West and ARCA Racing Series events throughout the season. Tanner’s younger brother, Taylor Gray, will also race full-time in a Late Model Stock Car for DGR-Crosley in 2019. Tanner, who is currently the top contender for the NHRA Pro Stock Championship in 2018, has competed in the series the last two seasons. He has collected 11 Pro Stock national event wins and made his mark by becoming the youngest winner in NHRA history at the age of seventeen. While the 19-year-old has excelled in drag racing, he encompasses a wealth of racing experience throughout his young career from running micro sprints on dirt to racing late models on asphalt. “I’m excited to get back to what I grew up doing. Everyone wants to know why I am transitioning to stock cars, but really, drag racing is newer to me than stock car racing. I grew up racing micro sprints, then outlaw karts at Millbridge [Speedway] and some late model stuff with LFR. Stock car racing was the plan all along for me,” said Tanner. The youngest Gray, Taylor, made his stock car debut earlier this year at Hickory Motor Speedway. Less than two months behind the wheel and he found his way to victory lane in a limited late model. Before racing late models, the 13-year-old Mooresville, N.C., native raced outlaw karts. DGR-Crosley will compete in late model stocks, super late models, NASCAR K&N Pro Series, ARCA Racing Series and NASCAR Camping World Truck Series events in 2019.